"Great setup. Easy to use and customize." Great setup. Easy to use and customize. Initial cost are high, but no monthly fees for satellite use. The maps are outstanding. I feel much more at ease knowing where our 3 Labradors are located. We can walk and enjoy our entire property. The handheld will even pick up satellite signals while in the house. "Very happy with service and the performance of the product." Very happy with service and the performance of the product. "Everything we hoped they would be and more!" Everything we hoped they would be and more! Very easy to use, and the features are superb! "Highly recommend their company for your gear." We have used the early versions of this equipment, and a friend told us about this unit. We have loved the incredible number of things that this system allows us to do in tracking our bird dogs and even tracking where our covey finds occur. Fabulous level of personal service from Gun Dog Supply. Highly recommend their company for your gear. System is an unbelievable! You need to spend a good deal of time to get familiar with the system. All components are of top quality. I highly recommend it. The only quibble is battery longevity, and the lack of a simple rapid charger for the collars. I use my system to keep track on my dogs. If you power down the collars when not in use, the batteries will last for days. Unfortunately, using the USB connector on the collar limits how much power can be applied to the collars. Therefore, it takes a while to charge them up. The charging clip is a bit meddlesome. Otherwise, awesome. Great product. Very handy while out hunting. Shipping was fast and on time. We use the alpha system for anything from hiking, tracking, and basic obedience training. We love it for all areas of canine sporting and fun. It works to train all three dogs at the same time. The LED light is fantastic for night time. I can track and use the e-collar up to 2 miles so far, have not tried it any farther yet. The conditions in which I use my collars is very wooded. Very simple to use, great quality and great customer service. I took the dogs out on the first run with the new Alpha Collars today. My dogs run big and hard. I have one that scouts at long distance. I was impressed on the accuracy of the tracking, the tone volume, and the correction intensity.It seems to be a good solid unit. I have had Tritronics for ten plus years and they still are as reliable as when I took them out of the box. 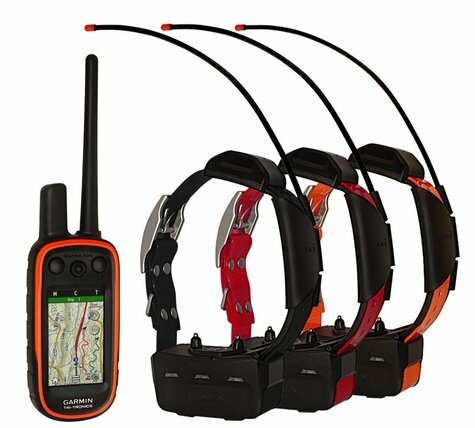 The reason I bought these GPS collars is because in late grouse season I lost one of my dogs in wolf country for 24 hours. It was a horrible feeling not coming home with one of your best friends. I am convinced it will never happen again with these new collars. I am glad I bought them early as it will take a while to get used to them.If anyone has dogs like mine that run big and point solid the Gamin Alpha is the best way to go. When your dogs are excited to have you put on their collars they cannot be anything but top quality. Thank You for the most accurate and truthful review I have ever seen. It was the reason I invested in the Alpha collars. Great product. It provides me with the dog's location and gives me the ability to bring them back if they go too far. The multiple levels of stimulation allows for great training and better response during hunting or everyday activities. Great product with too many features for just a hunting dog in my opinion. "I really like the alpha 100." I really like the alpha 100. It easy to use and works great. Almost gave it an average. I'm OK with the Alpha so far. It does have a lot of features that I'll probably not use. The e-collar seem hotter than my Pro 100 anyway. It's at least a level and half stronger. I will not use it for training corrections because in my opinion it takes to long to adjust the stimulation. I like the concept but it will take a lot of getting use too, too much in my opinion. This product is very nice for tracking multiple dogs and making corrections in the field. I would have rated it 5 stars, but I think the feature for handeling multiple pointing dogs could be improved. Too much time is wasted if needing to increase stimulation levels. Vs the traditional dogtra or Tri tronics products, regardless of how you have the handheld setup. But if wanting to consolidate tracking and training collars into 1 this is the best on the market!